April | 2012 | mmmmbike! 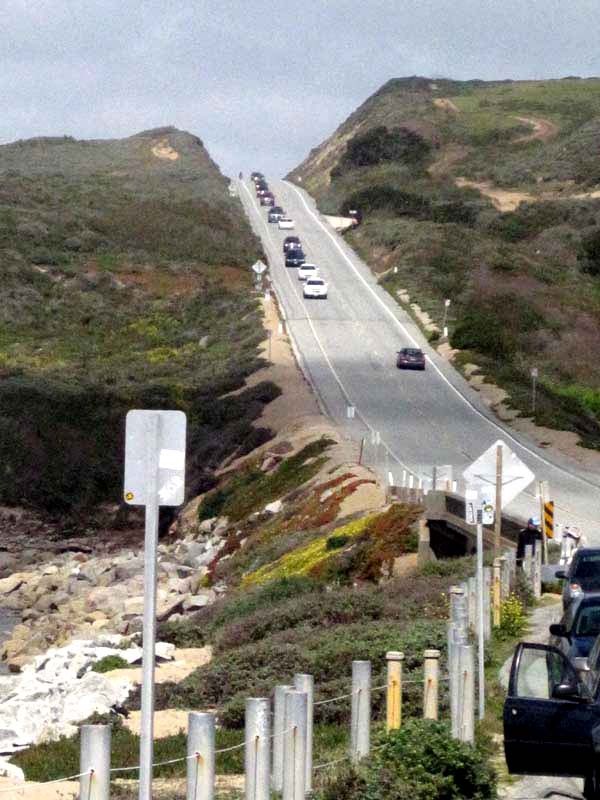 Fourth installment in the R12 series for me: San Francisco to Mountain View Permanent route #1288: the Coastal Cruz. Ely Rodriguez invited me to ride with him and his friends Omar and Sean. When Jesse Marsh, the route owner, issued me my brevet card and route sheet, he kindly reminded me to do my taxes before the ride. 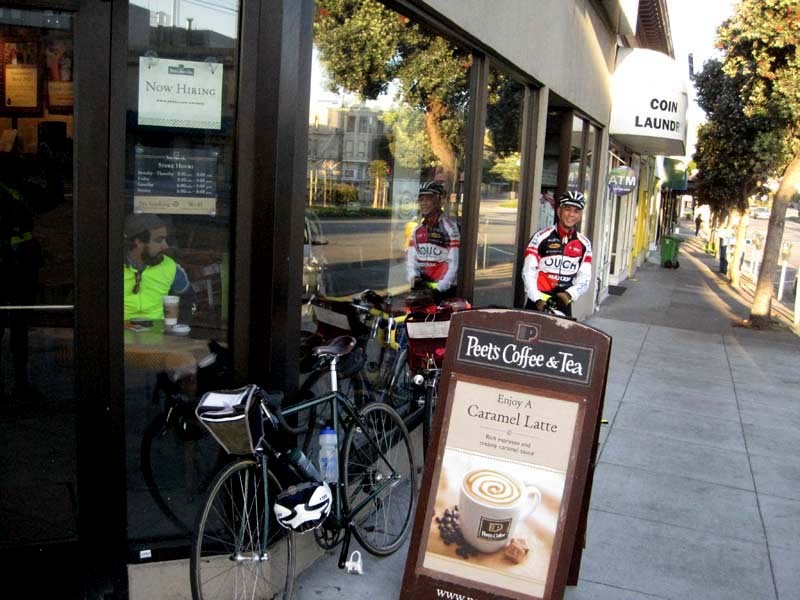 I did, so without a care in the world (well, mostly no cares), I set off on the morning of April 14 for Peet’s Coffee on Geary. This ride was a great skill-builder for me. The route has a lot to offer: beautiful views of the ocean along highway 1, some nice climbing along Stage Road, a technical descent or two (a good chance to practice the lessons learned in the SFR bike handling skills class, which I feel becoming more habitual), a chill cafe atmosphere at Ugly Mug in Soquel (another new and important skill for me to learn: this practice of “chillin'”. wish me luck), more road climbing along Soquel- San Jose Road, and even some climbing and descending on a dirt trail! Whew. 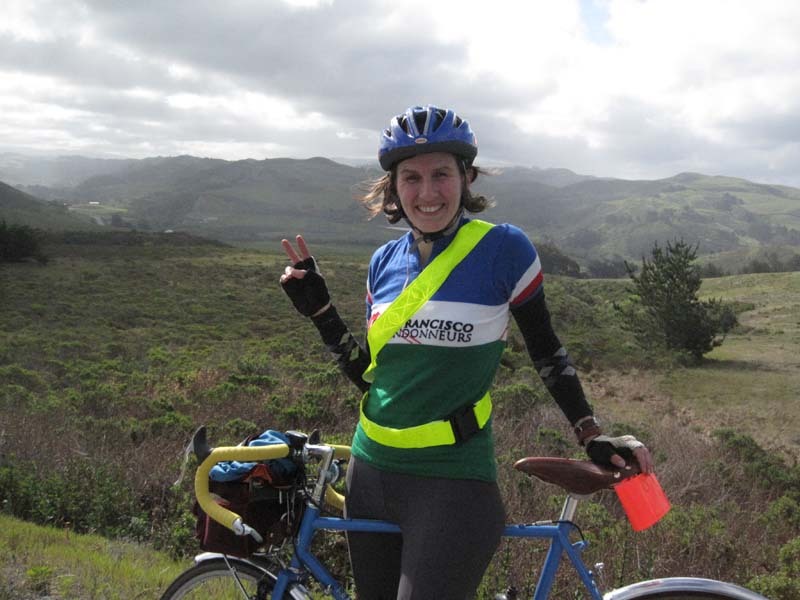 It was all completely new territory for me, as all my riding thus far has been in Marin County. Another new experience for me on this ride was pacelining. Most of my training rides I do solo, so I haven’t had the chance to learn this. I still have a lot to learn about it, but toward the end of the segment when we were pacelining, I think it started to click for me. Ely gave us some helpful tips about it, which I tried to put into practice as much as possible. When we were about 20 miles north of Santa Cruz, Sean’s bike started to shimmy dramatically on a steep descent, and his rear tire blew. Right where the cloud is shadowing the highway in this photo is where Sean’s tire blew out. I was behind him, and could smell the rubber burning– he ended up with a skid hole through tire and tube about five inches long! He handled the situation amazingly well, and was able to control his bike enough to move off the road and come to a safe stop. Unfortunately he did not have a spare tire, only a spare tube, and the tire boots that Ely had brought were not long enough to cover the hole. However, Sean “made do”, as we say, and was able to make it for about ten more miles before blowing out the spare tube. We were all close enough to the next control that Sean told us to go ahead while he waited for the patch glue to set, and he would catch up with us at the Ugly Mug control. Poor Sean ended up having to jog with his bike part of the way to Santa Cruz to reach a bike shop to get a new tire. Sean is a really strong rider, and he finally caught up with us on the ascent to Summit Road. Once I got home I read the Lennard Zinn interview in the latest Bicycle Quarterly about tall riders and frame fitting issues– as Sean is indeed a tall rider, I wonder if that had something to do with the blowout. In spite of that unfortunate incident, our group made good time overall– 11h16 from start to finish. We had a fantastic meal near the train in Mountain View (meatloaf with mashed potatoes and spinach for me, yum!) and hopped on Caltrain for the return home. Beautiful weather had prevailed for us throughout the day, and once again I feel so lucky to be able to spend so much time on the bike.